MBABANE, Jul 31 2012 (IPS) - Swazis should not see the ongoing nationwide one-month teachers’ strike as a movement capable of overthrowing the political regime here, despite the fact that civil servants and nurses have joined the action, according to political analyst Dr. Sikelela Dlamini. Since Jun. 21, teachers in this southern African monarchy have engaged in an indefinite strike demanding a 4.5 percent cost of living increase, which has left thousands of pupils in about 30 to 50 percent of the country’s 179 secondary schools and 153 primary schools without teachers. 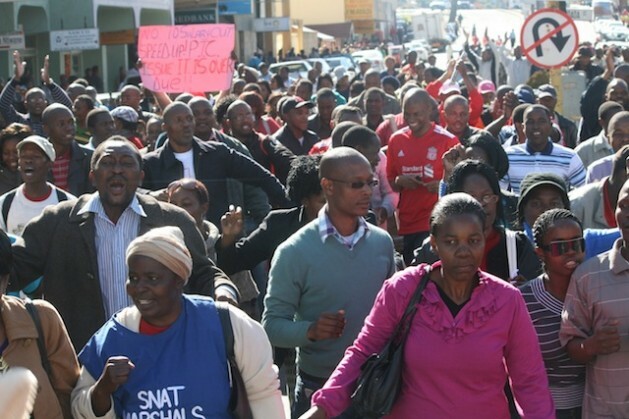 The country’s National Association of Public Servants and Allied Workers Union has also since joined the strike, although over 70 percent of its members are at work, and the Swaziland Democratic Nurses Union is engaged in a go-slow after the government won an interdict in the country’s Industrial Court against full-blown strike action on Jul. 19. The inflation rate currently stands at 9.43 percent, which has made it difficult for the 63 percent of Swazis living below the poverty line of two dollars a day to put food on the table. But Dlamini and other analysts feel that the struggle for democracy in Swaziland lacks clear political alliances between labour and political organisations. Dlamini told IPS that Swazis should not read too much into the teachers’ strike because workers have not yet declared their regime-change agenda at the negotiating table. In addition, only just over half of SNAT’s 9,000 members are on strike. “No amount of all-out protest and defiance on the part of labour alone is sufficient to topple the status quo without a clear political direction,” Dlamini told IPS. While workers are in a strategic position to challenge King Mswati III’s regime because they can withhold the labour that fuels the economy, Dlamini said that the country needs political organisations to negotiate and contest power. Political parties have been banned in Swaziland for almost four decades and King Mswati III’s government continues to use security forces to quash any political dissent spearheaded by trade unions. Following the fiscal crisis that has hit the country since 2009, after a 60 percent decrease from Southern African Customs Union income, workers began to call for political change, better working conditions, and below-inflation salary increases. A United Nations Impact of the Fiscal Crisis in Swaziland survey released on Mar. 16 said that 21.9 percent of surveyed households have experienced reduced income since the crisis hit in 2009. And about seven percent of households surveyed admitted to having a member who lost a job as many families here survive on a meal a day. The government has said that there is no money to pay public workers, whose salaries constitute a significant 52 percent of the national budget. Last year, the cash-strapped country took out a 320-million-dollar loan with neighbour South Africa. And at the time, the International Monetary Fund advised the Swazi government to reduce public servants’ salaries by 4.5 percent and politicians’ salaries by 10 percent, to save the government 24 million dollars a year. However, the government has refused to adhere to calls demanding the cancellation of the controversial Circular No. 1, a government gazette that awards politicians, including the prime minister, cabinet ministers and members of parliament, lucrative perks. The government also continues to spend, and has plans to purchase 800 new cars over five years. In addition, Mswati, Africa’s last absolute monarch, who has 13 wives, has also been criticised for his lavish lifestyle. The South African Mail & Guardian newspaper reported on Jul. 25 that three of the monarch’s wives are to soon go on holiday to Las Vegas, in the United States, with a 66-member retinue. “We want a competitive government that will care about ordinary people instead of only those in power,” Mazibuko told IPS. The government has responded to the strike by cutting the striking teachers’ July salaries by a third. It said that this was done because the strike is illegal as the Industrial Court recently ruled against it. However, teachers remain on strike. But South African-based socio-economic analyst Thembinkosi Dlamini told IPS that civil society organisations in Swaziland, particularly labour unions, are weak and not very well coordinated to challenge the regime. “The state has also made frantic efforts to dismantle any form of collective effort that could bring pressure to bear on the system,” said Dlamini. For instance, in March the government registered the Trade Union Congress of Swaziland (TUCOSWA), only to deregister it in April after stating that there is no legislation governing the merger of trade union federations here. Trade unions felt that the government was trying to weaken the labour movement by deregistering TUCOSWA so that there could be no unity among workers, which could lead to them protesting against the government. Meanwhile parents and public school pupils, who are supposed to be sitting for their mid-year examinations, are the ones most affected by the labour action, said human rights activist Doo Aphane. Some children do not even attend class currently, which exposes them to all sorts of risks, including sexual abuse and drug use, Aphane told IPS. “Our government lacks a human rights-based approach because it is clear that the government has not taken into consideration the plight of the many ordinary people who are suffering because of this strike,” said Aphane. Prime Minister Sibusiso Barnabas Dlamini has threatened to fire striking teachers and close down schools if the strike continues. He has maintained that public servants will not receive a salary increase for the next three years. He said that the government’s decision to buy cars to the value of 2.4 million dollars when it claimed that there was no money for workers showed how insensitive those in power were. “That’s why people are now calling for a system that will ensure that those serving in the government take the citizens seriously,” he said. Analysts insist though that it will take more than a group of aggrieved workers and empty threats to bring about political change in Africa’s last remaining absolute monarchy.